Malala Yousafzai, the Pakistani activist and youngest person ever awarded the Nobel Peace Prize, cites the role of technology in her global campaign to promote education for girls. 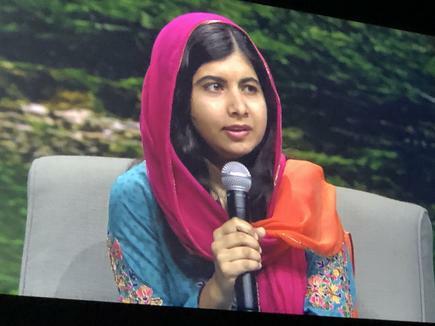 “We are using technology to help girls in refugee centres to catch up on the education they missed,” says Malala, who spoke at the VMworld conference in Las Vegas this week. She says these girls can connect up to 30 computers even when there is no electricity. “We need to make sure we do not develop a gap between this generation and the next generation,” says Malala, now aged 21 and a student of philosophy, politics and economics at the University of Oxford. Malala was shot on the left side of her head by a Taliban member on her way home from school in October 2012. All she remembers was she was talking to her friends about their school exams on that day. When she woke up, she was in a hospital in the UK. The nurse showed her some of the get well cards she received, in the hundreds, from people across the globe. She realised hate and anger is “a waste of energy”. She set up the Malala Fund which runs programmes to help educate young girls across the globe.The Malala Fund supports programmes in countries like Nigeria, Pakistan, India, Bangladesh and Syria. She is also the author of the international bestseller I Am Malala and was named one of ‘The 100 Most Influential People in the World’ in 2013 by TIME magazine. She explains Malala Fund focuses on secondary education of girls as this is the age where girls drop off most due to lack of funding. 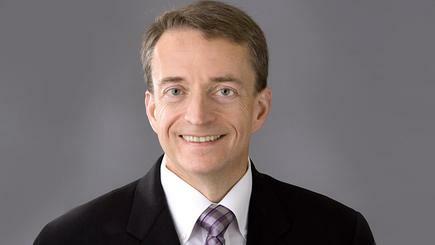 “She is an extraordinary young lady, a kid in some respects, and an articulate stateswoman for the world,” says VMware CEO Pat Gelsinger. It was the first time Malala spoke at a technology conference. 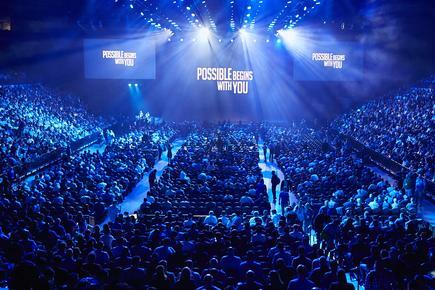 The more than 20,000 attendees at VMworld gave her a standing ovation when she appeared on stage. “Malala and her fight for educational rights of girls and children around the world is an inspiring example of how one person can ignite a ‘force for good,’ even in the face of adversity,” says Sanjay Poonen, chief operating officer, customer operations at VMware. 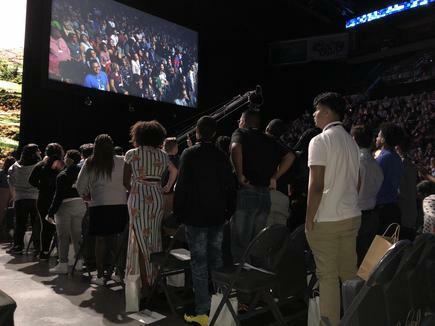 Malala was introduced to 100 high school students from Basic High School and Legacy High School in the Clark County, Las Vegas school district, who were invited by VMware to listen to her speak. “Use technology to raise awareness,” she says, echoing her message to the technology professionals at the conference. 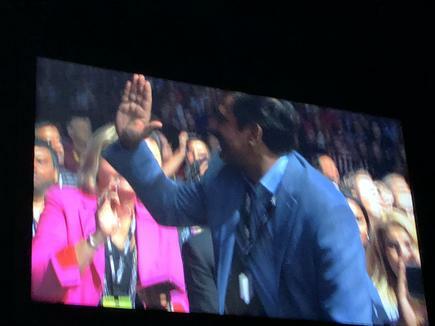 At VMworld, Malala says she was in her chemistry class when she learned she won the Nobel Peace Prize. She says she misses her hometown Swat Valley. The landscape of the valley was used as the background on the stage, where she was being interviewed by Poonen. Poonen acknowledged the presence of her father Ziauddin Yousafzai, in the audience. Malala says her father saw how his sisters did not go to school, while he and his brothers were getting an education. Thus, he made sure she got an education, and is one of her strongest supporters. He did not mind the people who visited their home when she was born and commented, “Don’t worry next time you will have a son,” says Malala. 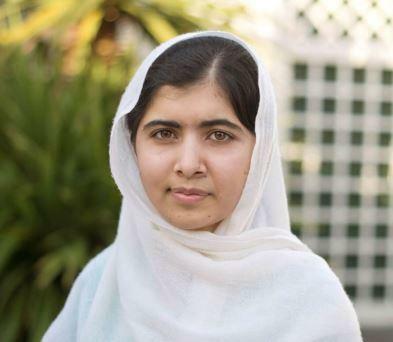 Malala says her name means ‘grief stricken’ but was also the name of a female Afghan freedom fighter. She says when the Taliban Group gained control of their place in 2007 and 2009, they forbid music, did not allow women to go to market, and stopped girls from going to school. They were implementing their own so-called Islam, and were spreading ignorance, she says. She says there are millions of girls across the globe who have no access to education. They face different challenges, such as poverty, early child marriage and conflict. She says a World Bank research estimates investing in education for young girls equals to US$30 trillion in the world economy. The report, released as part of the July 12 United Nations Malala Day this year, finds less than two thirds of girls in low-income countries complete primary school, and only one in three girls completes lower secondary school. On average, the report says, women who have a secondary education are more likely to work and earn almost twice as much as those with no education. “We must not ignore this,” she says. Investing in girls’ education “is the most useful and economically sustainable investment you can ever have”. “They made a mistake,” she says, of the people who do not agree with her advocacy.